Is it safe to drink your tap water at home? If you haven't tested your drinking water and question if it is safe to drink, contact CTL-Lab by phone (800) 962-5227 or by E-mail. We will send you a CTL water testing kit along with instructions. If I wanted to send you a water sample from my home, how would I send it? 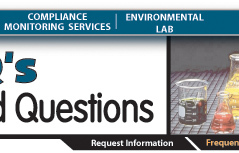 Call CTL at 1-(800)-962-5227 or E-mail CTL Lab Service Representative and request a water testing kit. Please let our Service Representative know if you are sending a sample from your home, your business, or a state agency. There are different requirements for each. I have a nitrate result greater than 10 ppm (mg/L). Is my water safe to drink? What can I do to make my water safer to drink as far as nitrates are concerned? The USEPA and the State of Wisconsin has set a Maximum Contamination Level (MCL) of 10 ppm (mg/L) nitrate for public drinking water supplies and as a guide for private water supplies. A MCL is the highest level of a contaminant that is allowed in drinking water. Nitrates are dangerous especially to infants under the age of 6 months. Some symptoms include shortness of breath and blue-baby syndrome. Most adults are not overly affected by nitrates. Water Care Specialist, Plumbers, and Well Installers are all good sources for treatment systems for nitrates. There are several systems available to treat water for nitrates, and these professionals will be able to suggest the best system for your needs. I have a white (or some other color) buildup around my sink drain and shower stall. Is this coming from my water? How can I tell if I have lead in my water? Your local public water supply is required to test for lead on a regular basis. You can call them or ask for the latest issue of their Consumer Confidence Report (this will list all the constituents the supplier must test for and whether or not any contaminants were found). If you live in an older house, one which may have lead pipes or lead based solder call our lab for specific instructions and special sample bottles to have a sample analyzed. - Non-Detects (ND) - laboratory analysis indicates that the constituent is not found. - Parts per million (ppm) or Milligrams per liter (mg/l) - one part per million corresponds to one minute in two years, or a single penny in $10,000. - Parts per billion (ppb) or Micrograms per liter - one part per billion corresponds to one minute in 2,000 years, or a single penny in $10,000,000. - Parts per trillion (ppt) or Nanograms per liter (nanograms/l) - one part per trillion corresponds to one minute in 2,000,000 years, or a single penny in $10,000,000,000. - Parts per quadrillion (ppq) or Picograms per liter (picograms/l) - one part per quadrillion corresponds to one minute in 2,000,000,000 years or one penny in $10,000,000,000,000. E. Coli is generally killed at what temperature? Always cook meat, especially ground meat, until the juices run absolutely clear, pink is not good enough. It is generally good for the internal temperature of a hamburger patty to reach 160 degrees F to kill all contaminating E.Coli. What if I need to send something that needs to remain frozen? How do I send it to you? How would I pack it? If you mail anything frozen, it is best if you pack it in "dry ice" and send it next day service. This will keep your product frozen. A typical food travels an average of 1,100 miles to reach your table. Source: National Food Processors Association. Are your cattle getting all the nutrients they should be? To be sure your livestock are getting a balanced diet, have your forages tested for the basic nutrients, and send a sample of your forage to Commercial Testing Laboratory. Call or E-mail us for a forage sample bag and mail it to CTL. Bags are self-addressed and postage paid. How long do I have to wait for my test results? This depends on the method of testing. The NIR testing is usually same day results, although not all samples can be run on NIR. The other method of testing is by Wet Chemistry. This method will take longer because of the drying process and other testing procedures the Wet Chemistry method entails. Turn around time for the Wet Chemistry is usually within 3-5 working days. Do you monitor your equipment to ensure your customer's results are accurate? Yes, our Laboratory Technicians run Quality Control samples on a weekly basis. The NIR instruments are constantly maintained and on a daily basis check samples are scanned ensuring our customers receive accurate results. 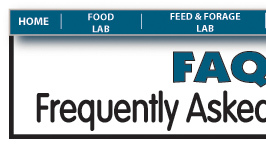 CTL is a member of the National Forage Testing Association (NFTA). We are also members of the NIRS Feed and Forage Consortium. See our certification page. For more information, please contact our Lab Service Representative by phone 1 (800) 962- 5227 or by E-mail. What is your office and laboratory hours? We are open Monday through Friday, from 8:00 a.m. until 4:30 p.m. If I'm unable to read or understand the test results, will you have experienced professionals at CTL explain to me what the result mean and answer my questions? Yes. Feel free to call us at 1-(800)-962-5227 or E-mail our Lab Sales Representative. WHAT TYPES OF CLIENTS DO YOU TEST FOR? Agri-Business, Animal & Pet Food Manf., Biological Supply Houses, Bottle & Breweries, Confectioners, Canning Companies, Dairy Industry, Delicatessens, Drying Plants, Fast Food Industry, Food Distributors & Brokers, Grocery Industry, Fur Farms, Government Agencies & Municipalities, Health Care Facilities, Heavy & Light Industry, Metal Finishers, Pizza Manf., Plastics Industry, Poultry Producers, Public Utilities, Pulp & Paper Manf., Realtors, Restaurants, Sausage Makers, Veterinarians, Water Treatment Companies, Well Drillers, Home Owners, and the list goes on. What if I live in another state, not in Wisconsin, and would like something tested. Would I have to get the sample to your company within so many days? And how would I send the sample? This depends on what type of sample you are sending. Some samples require overnight mailing whereas other samples do not need to be sent overnight. The best way to find out how to send your sample is to contact us by phone at 1-(800)-962-5227 or E-mail. Questions regarding how to send your sample and if there is a time limit in getting the sample to CTL will be answered by our Service Representative. When was your company established and how many employees do you have? For our History, visit our History page. We currently have 39 employees. Our Company's growth has been slow and strong. We are extremely proud of our employees. Our Laboratory Technicians are dedicated to their work and to the Company. Over 70% of our full-time employees have been employed at Commercial Testing Lab for over 8 years. Commercial Testing Laboratory's philosophy is to recognize our employees, "they are our Company's foundation" and to give the highest quality customer service with a personal touch. We are located in Colfax, Wisconsin, population 1,100. Colfax in the West Central part of Wisconsin, between Menomonie and Eau Claire. You can contact our Lab Customer Service Representative via E-mail, phone 1-(800)-962-5227, or fax (715) 962-4030.